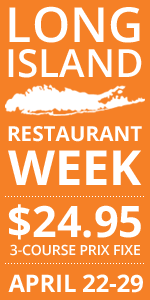 Some of Long Island's better (and best) restaurants have one thing in common...they can be found on Routee 25a as it winds through St. James along the north shore of Long Island. Take a drive along Suffolk County's "restaurant row" and you'll come upon Mirabelle (which is widely regarded as one of L.I. 's top restaurants, Kitchen - A Bistro (a BYO championed by area chefs as their favorite spot to eat), Bella Vita City Grill (a highly-rated Italian-American), and Oscar's of St. James, where Nena and I dined a little over a week ago. Top-to-bottom, it was one of the best meals we've ever had. It's not directly food or wine related (though lots of both were consumed before and after), but this is by far my favorite picture from the weekend...the gang from Al and Jenn's BBQ on Sunday. Luckily it came out...and luckly the camera didn't fall allll the way down to the beach below. I know the last time I ran down the cliff it took me an hour to get back up. Nena and I still rent...a cute little beach bungalow of a house about a mile from the Long Island Sound. 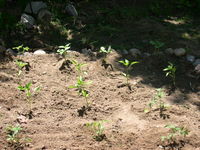 As such, we have fought the desire to beautify the outside too much...usually sticking with some flowers in the front and cleaning up all the leaves in the spring. We'll see how it goes...but it will be fun regardless. Some teetotalers might disagree, but to many, Long Island wine country is the perfect destination for any sunny afternoon – whether you’re single, a couple, or a family. But with so many events and happenings planned all summer, some wineries are much more family friendly than others. Beer. Lager. Ale. It’s what most Americans serve with grilled fare at their weekend BBQs, and with good reason. It’s cold, refreshing and a great thirst quencher on a steamy summer day. Beyond beer, you might serve margaritas or maybe even sangria, but wine in its pure state doesn’t make much of an appearance when we fire up our grills. Maybe the outdoor setting, the primitive pleasure of open fire cooking, and the macho image of grilling pushes wine into the background. But why not serve it? Wine isn’t a snobby, pretentious luxury item, and wine can be the perfect match for grilled food. Plus, it’s not as filling as beer, or as potent as a margarita. 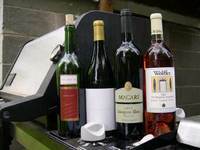 So now that you’ve decided to serve wine at your next barbeque, which ones do you choose? Like any other meal, it really depends on what you’re grilling. Generally though, you shouldn’t serve delicately nuanced wines with foods from the grill. The wine needs to stand up to the bold, fresh flavors found in most rubs and marinades and the charred flavor of grilled meat can overpower a wine’s complexities. Most of the time, it’s best to stick with flavorful, aromatic wines that are fruit forward and generally not heavy on the tannins. Underage drinking is on the rise, and the recent U.S. Supreme Court decision may make it even easier for minors to get access to alcohol ("Wine commerce could change," May 17). Currently, if someone tries to buy alcohol in our state, he or she has to undergo a face-to-face ID check at a liquor store, where staff is trained to recognize fake IDs. This is a great mechanism to keep alcohol out of the hands of kids. However, over the Internet, no one knows who you are — a minor using a parent's credit card can easily order alcohol. And if the alcohol is delivered directly to the home, then the only person who can check IDs is the delivery truck driver, who hardly has the time or the training to properly validate the age of the recipient. This is a system that is ripe for abuse, which is one of the reasons why direct shipments of alcohol over the Internet have been banned in the past. However, the recent court decision threatens to overturn this. I strongly support laws that prevent underage consumers from buying alcohol over the Web, and I encourage our attorney general and all of out elected officials to keep fighting to protect our kids from this menace. Are you kidding me? There are so many stupid comments in this letter that I barely have room here to write them. (Keep in mind, I can write virtually as much as I like ;) ) Anyway, here's a few of my comments to Mr. Phariss. Is underage drinking on the rise? Maybe...I don't know definitively either way. But, is the Internet to blame? Minors don't want to wait a week for their wine shipment to arrive. They're much more likely to pay a bum ten bucks to buy them a six-dollar six pack first. Don't laugh, I know people that did this in their youth. I guess it's possible that a minor could use his/her parent's credit card to order wine on the Internet, but should goverment regulations take the place of good parenting? How did the minor get the credit card? Are parents not monitoring their own credit cards? And how can the kids recieve a wine shipment without their parents knowing? How can they make sure their parents aren't home when it comes? Seems an unlikely scenario to me on so many levels. Delivery truck drivers don't have the "time or training" to check IDs? As someone who receives wine shipments a couple times a week, let me tell you, they do check my ID and make me sign for it. I guess it's possible that a kid will use a fake ID to get wine...only if the 10 grocery stores, 20 convenience stores and 30 bars in town won't fall for it. "...protect our kids from this menace." Menace? Are you referring to poor parenting or to wine? I guess this is the kind of language I'd expect from a somtimes-Bible-thumping state like Mississippi. I can't believe you're more worried about this than the drugs your kids are probably exposed to or even offered every day at school . Nice priorities. "...system ripe for abuse." Right. Are kids even buying wine? 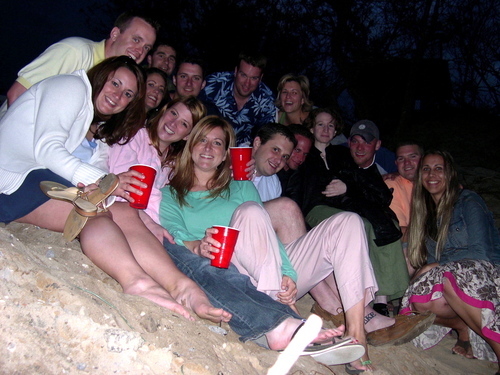 I hated the stuff until late in my college career...around when I turned 21. How is this system any more ripe than liquor stores, convenience stores or grocery stores? I've bought alcohol from each before I was 21...without ever owning a fake ID once in my life. They are no more stringent. Trust me. Sorry for the rant...but there you have it. Charles is among my favorite people and thinkers in Long Island Wine Country. He's always great for an insightful, frank quote. I particularly like these comments...especially because they consider the customers' side of things too. "In my opinion this is more about personal liberty and freedom. As adults we do not need anyone in a free society to tell us how we should behave. When you can purchase a weapon on the Web it is silly that you cannot purchase a bottle of wine in the same manner. The argument about teenagers is bogus as we all know. Jim Trezise (of the New York Wine & Grape Foundation) gave me a reference to a study by the FTC that dealt with that definitively. In our case, one can properly ask what would we get out of it since we are selling all of our production anyway. In the near term, not much new business, however we want to be responsive to our customers. For instance, when someone who visited us from Connecticut wants to reorder our wine we want to be able to resupply that wine and not turn away repeat business. As we all know much of what we do is to earn the repeat business and so it hurts when you cannot be responsive because the law has been hijacked to the benefit of the liquor lobby. In the long term, and we have just planted 12 acres, we want to expand our business as our children work here and they are as passionate about wine as we are. And in order to properly support them, we need to grow. One aspect of growth is to tap into our large base of out of state visitors who have been trying to have us ship wine to them. Also we will more aggressively grow our wine Club. Bottom line it is good for all small wineries since they have no chance to have the distributors sell their product." Ever since I discovered delicious steel-fermented chardonnays from Peconic Bay Winery and Macari Vineyards here on Long Island, I've been on the look out for the same style of wine being produced in other regions...without much luck initially. The "I hate Chardonnay...it's too buttery and oaky" contingent, however, has caused more and more producers to hop the no-oak train, including this wine...which comes from Down Under in Western Australia. Nose: Reminds me a lot of Macari Vineyard's Early Wine on the nose, but a bit more tropical with faint pineapple and peach joining nice citrus aromas. There even a little spice it warms. Tongue: Medium bodied with some acidity and simple fruitiness. Not nearly as fruity as the Early Wine...or as crisp. Finish is a little flat for my tastes. Overall: Definitely a nice, easy-drinking white that chardonnay haters would probably like. Chill it and chug it this summer. (Okay, I never advocate chugging wine, but it's a quaffer and I liked the illiteration.) Would definitely buy this again and serve it in warm weather. Nena likes it ice cold...I like it a little warmer. "I think it will be good for the region as a whole. For example, at the moment I cannot ship wine to my Pfizer colleagues who live in New Jersey or Connecticut. It's a felony to even cross state lines with wine in the car. I have gotten requests from people from Massachusetts, Rhode Island, Pennsylvania, and the Carolinas, who came to Long Island for a visit, tried the wines, and then wanted to order some from my website once they get back home - in the past I had to turn these people down, but in the future I will be able to ship to them. Also, it has been said that magazines with a nationwide distribution have been reluctant to review wines that are not readily available nationwide. I am not sure if this is true or not, but with the new legislation, it should be possible for a New York winey to ship wine directly to the interested consumer in Chicago or California or wherever without going through a national distributor. The large national distributors simply do not carry small winery's wines. I think in general, anything that encourages free trade is a good thing." "You might think that the current regulatory environment wouldn't have much of an impact on us, since we (The Tasting Room) are a group of boutique wineries producing extremely limited quantities of handcrafted wines. Unfortunately, that's not the case. We turn away literally thousands of dollars of gift orders every December, and on an ongoing basis we have to tell visitors from Connecticut and New Jersey that they can't join our wine club. This also has an impact on press coverage, since many writers outside the area are reluctant to devote any ink to Long Island wines unless their readers are able to buy them. This ruling has the potential to break down that barrier, since anyone who wants to write about Long Island wines can just footnote the article with a list of web sites. Of course, I'm a pessimist, so I also think we shouldn't celebrate too soon, since as far as I can tell this is only half the battle. We still need to work with key states to ensure that regulations are enacted that will make it feasible for small wineries to actually ship wine (e.g. if I have to purchase a $500 annual permit to ship wine into Vermont I'm going to think twice about it)." Roman Roth, general manager and winemaker at Wolffer Estate Vineyards in Sagaponack, started his winemaking career at an age when most of us are focused on getting our drivers licenses and, if we're lucky, our first cars. But, it was a natural thing for the German native. "I was 16," he says. "My father was a cooper and a winemaker before starting a wine and beer merchant business. As a result, both of my parents were wine lovers and collectors. Wine always played a special part in any occasion. I was intrigued by the winemaking process and all the different [wine] regions in the world. The creative aspect and the opportunity to travel ultimately made me stay in the business." And travel he has. After his initial three-year apprenticeship at the Kaiserstuhl Wine Cooperative in Oberrotweil, Roth left Germany for the U.S. in the summer of 1986. He worked briefly at Saintsbury Estate, a respected winery in Carneros, Calif. known for its Pinot Noir and Chardonnay, before heading "down under" to work at an Australian winery you've probably heard of—Rosemount Estate. "The Supreme Court ruling is a grand step in the right direction. Soon our loyal customers throughout the country will be able to enjoy the simplicity of picking up the phone or going online and ordering our wines direct without the burden of the antiquated three tier system. This will have a profound and positive effect on our ability to expand our marketplace beyond our tasting room." Mr. and Mrs. Vinography have returned from their three-week trip to Egypt. 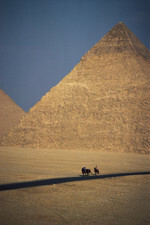 It is no surprise to me that Alder sampled several Egyptian wines...and apparently didn't think much of most of them. Anyway, if you're a Vinography fan...Alder is back and will likely return to his normal posting duties once his jet lag subsides. There's been a lot written about the U.S. Supreme Court's 5-4 decision to deem the ban on direct wine shipping unconstitutional. So much has been written, in fact, that I decided not to write something in my Dan's Papers column last week. But, because I did all the leg work for the story and interviewed/emailed with several Long Island winemakers and winery owners, I figured I'd not let that work go to waste. So, I figured I'd share some of their thoughts with you. Keep a look out over the next few days...I'll post them individually to break them up a bit (some are pretty long). "We're still waiting for the NYS legislature to resolve its position, however there's no question this is a monumental week for wine consumers and small farm wineries around the country. At Bedell Cellars and Corey Creek Vineyards, a positive resolution of the state and federal positions will no doubt have an economic impact on our business. Wherever possible, of course, we work very closely with our wholesale distributors around the country to satisfy customer requests. However, as a small farm winery it's not cost effective to maintain distributor relationships in every state, nor would we have enough wine to do so. As such, direct marketing programs are increasingly important. We host tens of thousands of visitors in our tasting rooms each year -- many of whom live far away or in states where our wines are not distributed, so they join the Wine Club to receive regular shipments. Others simply want the convenient service of being able to send their purchases back home. The Supreme Court ruling puts us in a stronger position to more adequately meet the needs of a rapidly changing and geographically diverse customer base." Long Island is home to 30-plus wineries, from tiny places making artisan fine wines to large producers (by LI standards) pumping out gallon after gallon of sweet-ish, almost jug-style wines. It can be tough for anyone heading east for the first time (or even the first five times) to know which tasting rooms to visit. Here are 10 LI tasting rooms you shouldn't miss. 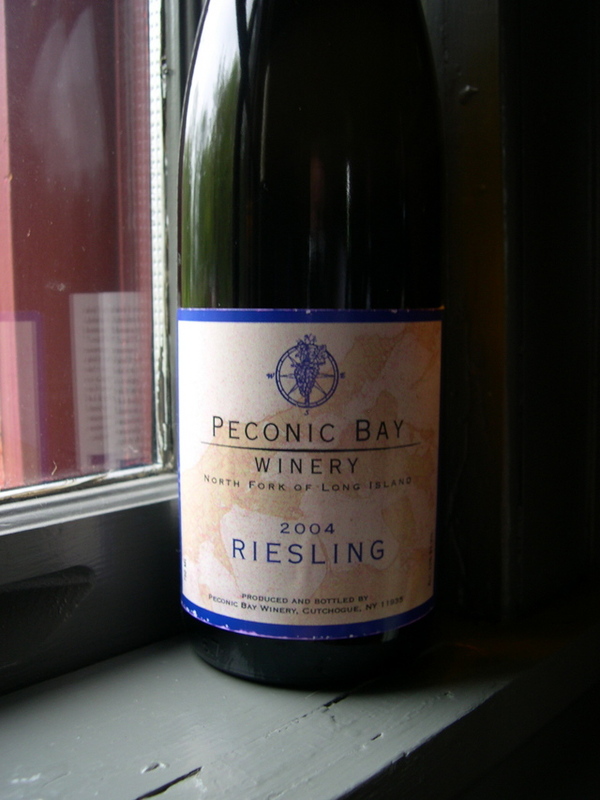 Peconic Bay Winery has always been a bit of an enigma to me. On one hand, they make sweetish blends that appeal to the masses and some hit-or-miss varietal reds. On the other, I love their Steel Fermented Chardonnay and their Riesling. I guess it’s smart to appeal to the widest audience possible, but I think it’s possible that serious wine drinkers get turned off by the plonk at the top of the tasting list. Last weekend, I tasted four recent and new releases, with positive results overall. Maybe Peconic Bay Winery is just hitting its stride? 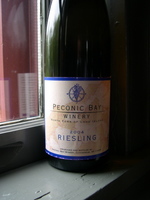 Peconic Bay Winery’s 2004 Riesling ($15) is bone dry, racy and deliciously crisp. Citrus dominates the nose with faint hints of stone fruit and a grassiness I wasn’t expecting. It’s simple, light and a perfect summer sipper. As always, winemaker Greg Gove hits the mark with my favorite of all white grapes. It wasn’t bottled all that long ago, and I expect it to be even better with a little more bottle time, giving the stone fruit flavors time to step forward. This is a terrific summer wine. In many ways, the Hamptons are all about the "new"—new restaurants, new superstars and new money. But not everything in the Hamptons is defined this way. Two of the top wineries on the East Coast can be found there, making wines that are much more Old World than New. Old World wines, typically those made in France, Italy and Spain, tend to be low-alcohol wines that are higher in acidity and feature more non-fruit flavors, like minerals, leather, wet stones or even tar. They also tend to show less obvious oak flavors than their New World brethren. New World wines, like those made in Australia, New Zealand, South Africa, South America and the U.S., are often much higher in alcohol content, fuller bodied and very ripe with fruit flavors and more obvious use of oak. LI's top wines, while technically made in the "New World," are often compared to those made in France, specifically in Bordeaux, because our climate closely matches the cooler growing conditions there, but not exactly. "The Long Island climate is close to Bordeaux when compared to the hot climates of Australia or California," says Roman Roth, general manager and winemaker at Wolffer Estate Vineyards in Sagaponack, "but Long Island is unique. We are much further south." If you haven't seen it already, check out Michael Steinberger' pro-Merlot (when done well of course) story for Slate.com titled Defending Merlot -- It's Not Always Bad. I drink merlot a lot...I admit it. But, almost never from California. As Steinberger says, they are often (usually? always?) overripe and almost never good values. I drink a lot of...drumroll please...Long Island merlot. I know, you're floored right now and can't believe it. Our cooler climate leads to a slow, steady ripening curve, mature tannins without losing fruit forwardness and leaving a touch of acidity. In the hands of our better winemakers...good (and sometimes great) wines are the result. This is not the innocuous merlot you can pick up for ten bucks at your local wine shop. I first tasted this wine on a cold, rainy Friday night, after a five-hour drive to Philadelphia that should have taken just a shade over three. Long Island traffic, the driving rains and, of course, the insanely packed New Jersey Turnpike tried to set the tone for a weekend in the City of Brotherly Love with friends...but when we arrived, Paul and Sara had this riesling waiting for us. And all was right in the world again. It was the perfect post-traumatic-driving trip elixer and we bought some the next day at Moore Brothers Wine. The Thielen family has been making wine in Merl since 1874. The wider surrounding area of Merl-Zell is best known for making gallons and gallons of Zeller Schwarze-Katz from Muller-Thurgau grown in the flat, shaded vineyards along the Mosel's banks. 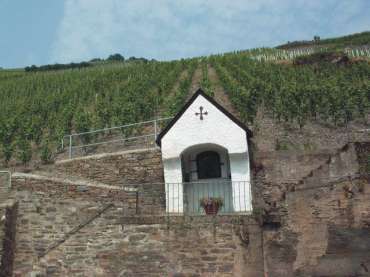 The riesling grapes for this wine were grown on the steep, slate-covered slope pictured above...far above the hamlet of Merl itself. Greg Moore (one of the Moore brothers) considers Fettgarten "the most important vineyard" in the region and this wine "among the finest rieslings made there in 2001." Eyes: Slightly golden and darker when compared to the other, much younger (in some cases 2004) rieslings I've tasted recently. This is a 2001 after all. Tongue: Subtle sweetness (can't find find any information on residual sugar) and zesty, prickly acidity provide the framework for lush peach and apricot flavors and a tantalizing, lingering finish that begs another sip. Absolutely delicious. Overall: I wish I had a case of this at home. But, this was our last bottle and, sadly, I'm not sure when I'll be able to get more. Moore Bros. doesn't ship it's wines (their wines never rise above 55 degrees...even when crossing the Atlantic, so they won't ship via UPS or FedEx either!). They are opening a store in Manhattan...but I'm picturing myself carrying a case of wine on the subway and then on the Long Island Railroad. This wine just might be worth it though. W. Blake Gray, a staff writer for the San Francisco Chronicle did a write-up today on wines from back east (non-Cali)...including several from New York (and Long Island). It's nice to see NY wines mentioned...but I think California wine arrogance reared its ugly head a bit in places. Richard Olsen-Harbich, winemaker and managing director at Raphael was interviewed for the piece. Take it from me, he is always great for a quote. I found his assessment of Long Island merlot particularly interesting...and I've inquired as to which ones were tasted. Not because I don't agree (I've said before that I like our cabernet francs better when done well), but I always like to know what "experts" are tasting when they taste Long Island wine. By the way...has anyone out there tried any of these Colorado bottlings? I need to get my hands on some I think. The rest of pinot noir's family is being left out in the cold...but that's about to change with Wine Blogging Wednesday #10 -- White Pinot, hosted by Alice of My Adventures in the Breadbox. 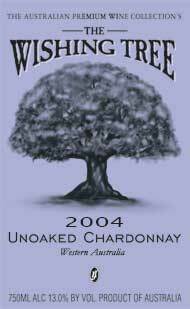 Many of you have been whining clamoring for some white wine themes for WBW, so here it is. You don't have to be a wine geek, snob or genius to participate either. Wine is supposed to be fun, not intimidating. 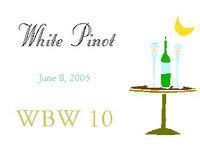 Any wine nerd you meet was a newbie once too...so please join us for WBW #10. Head on over to My Adventures in the Breadbox for all the details. I'm also happy to report that this juggernaut of a blog event has become so popular that I've got hosts lined up all the way through to February 2007. But, if you want to be added to the queue...just let me know. After swimming through posts covering 39 wines, Sam from Becks & Posh has finally gotten around to posting her round-up of Wine Blogging Wednesday #9 -- Tickled Pink. As you can see, she did a wonderful job for us...breaking the posts up by origin. Looking at the list, I'm thinking I need to reach beyond this over-grown sand bar for my wines...some great stuff out there it seems. If nothing else, I need to get myself some of the most-enjoyed bottles to try over the summer. Let's thank Sam for the great job done and the great WBW idea. Keep them coming people! In that vein...keep an eye out for a post announcing Wine Blogging Wednesday 10!!! To celebrate the Supreme Court's decision on wine shipments, Free the Grapes, a national coalition of wineries and wine lovers, is calling for all of us to raise our glasses tonight. I'm not sure what I'll be drinking tonight, but you can bet I'll be taking part in the toast. Down With the Wine Shipping Ban! Finally...the Supreme Court has declared wine shipping prohibitions unconstitutional. 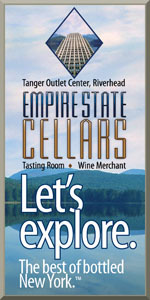 This is going to be big for Long Island wineries I think. While some argue that the old laws protect small, local producers...I think a lift on this ban is going to help some of our top winemakers get their wares in front of more people...which is always a good thing. I'm busy at the day job today...but I'm sure the entire wine blogging community be writing about this in coming days and weeks. 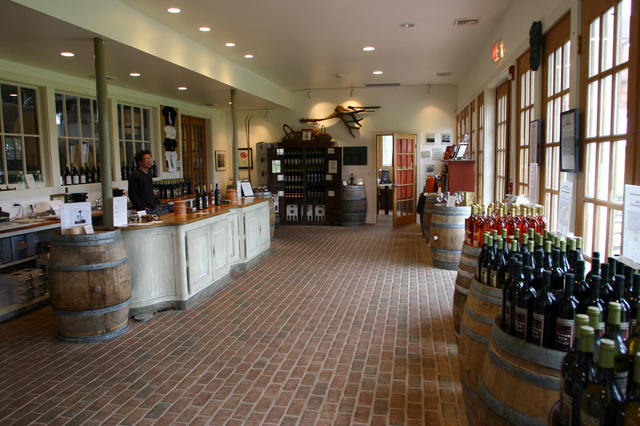 Located on sixty gently sloping acres in Peconic, Raphael is best known among North Fork wine trail junkies for its magnificent tasting room. Overflowing with Mediterranean style and offering spectacular views of the vineyard, the popularity of the facility is easy to understand. Behind this aesthetic splendor, I’ve always found the tasting room staff friendly and the wines good. The focus is Merlot, but I’ve always liked the Rose and Sauvignon Blanc as well. While the Raphael Sauvignon Blanc 2004 ($20) doesn’t display the mouth-puckering, aggressive acidity found in some Sauvignon Blanc (or even previous Raphael vintages), it is crisp, fresh and filled with kiwi and grapefruit and a little mineral character. It’s hard to argue that this wine was made for Long Island’s seafood bounty. You should open this ten to fifteen minutes before drinking to let a slight sulphur smell subside. Sulphur is used to prevent oxidation, don’t let it scare you. If you’re one of the people that complain that Long Island wines aren’t good values (I disagree, but that’s an argument for another column), I challenge you not to like Raphael Estate Merlot 2002 ($12). The first second-label Merlot from Raphael, it’s made with fruit from younger vines, but is super soft, with substantial blackberry and black cherry flavors with hints of spice and toasty vanilla. If you find Long Island Cabernet Franc to be inconsistent from year to year and producer to producer (I know I do), you owe it to yourself to try the Raphael Cabernet Franc 2001 ($40). From the ballyhooed 2001 vintage, it’s the first release of labeled Cabernet Franc from Raphael (it usually ends up in their La Fontana blend or Bel Rosso). Spicy and peppery, this dense, black cherry-rich red is intense but refined. It features full, chewy tannins and a lingering finish that’s nearly addictive. Raphael is committed to making this wine only in the best growing years, so Olsen-Harbich says “unfortunately this (wine) is something I don’t think we can do very often – once every ten years would be a good guess.” They only made 50 cases, but this is what Long Island Cabernet Franc can be. I can only hope I don’t have to wait another ten years for the next one. For more information on Raphael and their wines, visit www.raphael.com or call 765-1100.